green with envy? Not at all! 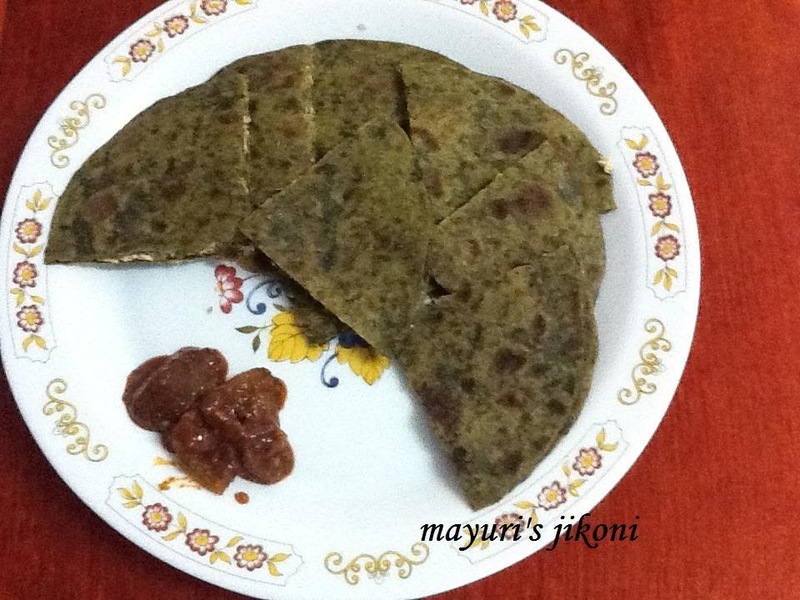 Another secret way to get kids to eat spinach (palak) and cauliflower is to disguise it into a paratha. On its own, many kids don’t like spinach. That is why there are so many ways to add the spinach to the kids favourite dishes without them really making a fuss about it. These parathas are stuffed with paneer and cauliflower and most kids love paneer (cottage cheese). For this recipe I prefer to buy the ready made paneer as its not too soft. Home made one tends to be too soft for this recipe. To prepare the dough, sieve flour and salt into a bowl. Add oil and mix it well into the flour.make the dough using the spinach puree. It should be of a soft consistency, similar to a chappati dough.Take a bit of oil and smear it over the dough. Cover and rest the dough for half an hour or so. Prepare the filling. Grate the cauliflower till you have about a cupful. Add all the other filling ingredients to the cauliflower except salt. Mix the filling very well. Add salt just before you are ready to prepare the parathas. Roll 2 parts into thin chappatis using flour. On one part of the rolled dough spread about 2 heaped tablespoons of the filling or just divide it into 6 parts and use one part. Make a thin layer of the filling. Dab the edge of the chappati with water. Place the other rolled chappati onto the filling. Gently press the edges. Put the stuffed paratha on the hot tawa. Let it cook till light brown specks appear. Turn it over. Cook again till light brown specks appear. Remember to cook over low heat. Smear the top part of the paratha with a tsp or so of oil. Turn it over with a spatula. Smear oil on the top part. Cook both sides till its crunchy and light brown in colour. Repeat steps 8 to 14 with the remaining dough and filling. Serve hot parathas with your favourite pickle or a bowlful of yummy yogurt. Cook the parathas ahead but without oil. When ready to serve, smear with oil and cook. Add salt to the filling just before making the parathas otherwise it will become watery. Can add grated carrots or minced peas or grated cabbage instead of cauliflower. I usually soak big florets of cauliflower in salted water for 10 minutes or so, dry it on a towel before grating to remove any worms if any. To prepare spinach puree please refer to my recipe on spinach masoor dal. For a more crispy paratha use half wheat flour and half plain flour. Use the dusting flour generously to avoid sticky parathas.